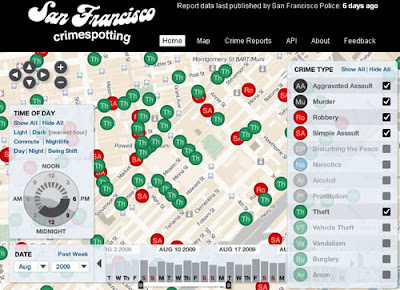 Stamen design have produced a very high quality crime map of San Francisco. At heart its a mashup of crime stats and cloud made base maps but they've produced an innovative 'pie of time' controller with which you can select different crime at different times. Pie of Time: The 'pie of time' is highly intuitive and usable. You can choose any selection of hours in the day you wish or use obvious short cuts to choose obvious time slices such as 'day', 'night', 'commute'. It scores much higher than the GEarth timeline controller (previous discussion) although it doesn't animate time so its not completely comparing like with like. Date Chooser: The pie of time also works with a highly usable date range or date chooser control at the bottom. A nice touch I noticed was that there is an indication of data downloading when you change the range of time, something I think GEarth doesn't handle well. Cloud Made Tiles: I'm impressed with the background tiles by cloud made, nicely subtle so as not to detract from the data. Layer Control: Is simple and the semi transparency is a nice touch. Rollover: At first sight I like the rollover behaviour which highlights other points in the same category as the one your mouse is lying over but I'd really want to see how it scored in usability testing: It could confuse low skill level IT users. Icons: I'm really surprised that given the amount of thought that has gone into the rest of this map that point icons are marked with letters rather than graphics. For example, a hypodermic syringe for narcotics and a bottle for alcohol crimes would be instantly recognisable and much more memorable.